Let’s go out to the lobby and dress up like a snack! 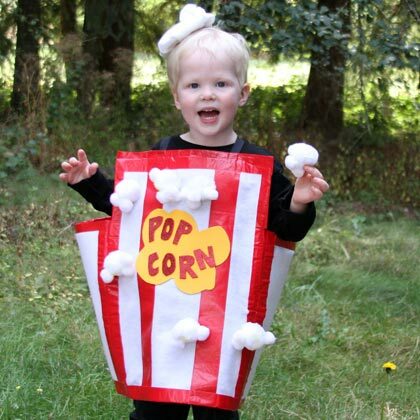 Your little movie-lover will be thrilled to wear this no-sew Popcorn Costume for Halloween. With a few clever materials, you’ll be able to make this no-sew costume in about an hour. 1. 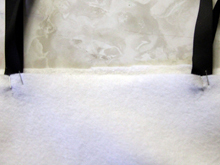 To begin, lay the white felt flat and cut out 4 rectangles. 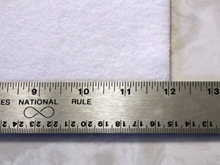 Two of the rectangles should be sized 12-inches by 18-inches (these will be known as “the long pieces”) and 2 of the rectangles should be 5-inches by 13-inches (these will be known as “the short pieces”). 2. These 4 felt pieces will form the popcorn bucket. 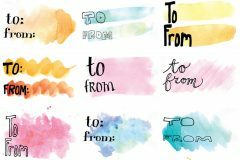 Arrange all 4 pieces in line on your work table. They should be arranged like so: long piece, short piece, long piece, short piece. 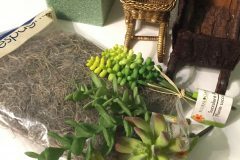 It’s important that the bottom edges of the felt pieces are aligned so they form an even line, and there should be about ¼-inch gaps between each felt piece. 4. 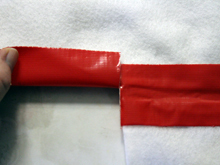 Run red duct tape between the felt panels (along the ¼-inch gaps between each piece of felt) to secure them together. Then flip the felt over and run tape between the felt panels on the other side, and press the two pieces of tap together where they touch in the gaps (this will allow the edges of the popcorn box to crease into the corners of the box). 5. 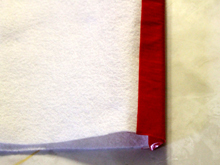 Run red duct tape (folding it horizontally, so half covers one side of the felt and the other half covers the flip side of the felt) over the edges of the long pieces of felt past where they align with the short pieces so all edges are covered. 6. Now, all pieces of the white felt should be taped together and every edge of the white felt—except for the tops of each panel—should be covered with red duct tape. 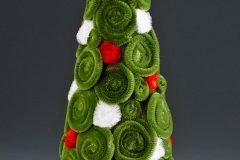 At the bottom, the felt pieces align evenly and at the top they are staggered, with the longer pieces taller than the shorter pieces. 7. 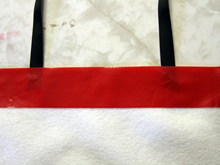 Attach the felt panel on the right with the felt panel on the left with the red duct tape creating a loop of the felt fabric. Crease each corner (between each panel) so the felt piece is now the rectangular popcorn box. The long pieces are the front and the back of the costume, and the short pieces are the sides of the box. 8. Use the red duct tape to add vertical stripes to each panel of the costume. I added two stripes to the front and back panels of the costume, and one stripe to the side panels. 9. Staple 2 pieces of the ribbon to the front of the costume (staple each ribbon about 6″ from each edge, so they look like the ties on an apron), and staple 2 pieces of ribbon to the back of the costume. 10. 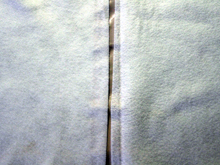 Cover exposed staples at the top of the costume with two pieces of duct tape – one across the front of the costume and one across the back. 11. 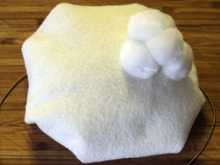 Cut a popcorn shape from the yellow piece of craft foam or felt. 12. 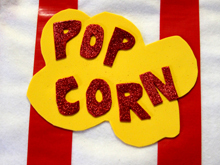 Cut out letters that spell “POPCORN” from red glitter craft foam (or use pre-cut letters) and glue them onto the popcorn shape. 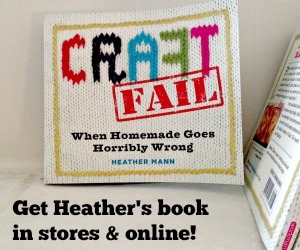 Once dry, glue this to the front of the popcorn box. 13. 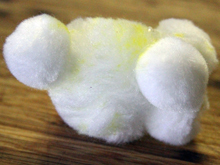 Make popcorn pieces by gluing 2 small pom-poms together and then gluing these to a large pom-pom. Glue 1 more small pom-pom on the other side of the large pom-pom to form a popcorn kernel. If desired, color popcorn kernel lightly with the yellow marker (especially in the crevices where the pom-poms meet each other) to make the popcorn look buttery. 14. 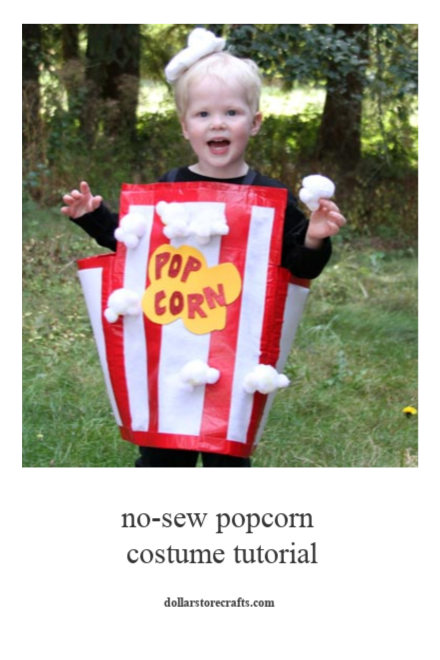 Glue popcorn kernels to the costume, or attach popcorn kernels to t-shirt with safety pins (or hot glue if you don’t intend to use the shirt again). 15. To wear, have your child stand inside the box and tie the ribbon over his shoulders. 1. 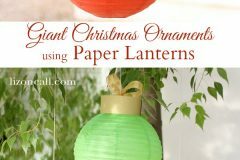 Crumple up the paper towel sheet and glue it to one side of the 6-inch cardboard circle. 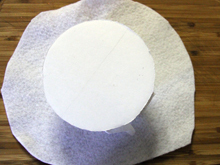 Then, turn the cardboard circle over, and put a line of hot glue around the outside of the cardboard circle, close to the edge. 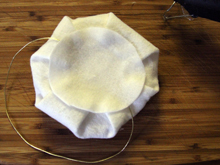 Fold the 8-inch felt circle over around the entire edge so it’s covering the side with paper towel (which will make the hat puff up on top) and is secured by the glue on the other side. 2. 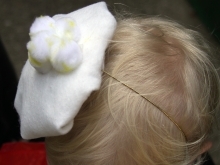 Measure the ¼-inch elastic all the way around your child’s head going under his chin. Cut the elastic so that it’s snug but not too tight. Glue raw edges of elastic flat to middle of cardboard circle (on the underside of the hat). 3. Glue the 5-inch round piece of felt over exposed the cardboard and elastic (on the underside of the hat). 4. 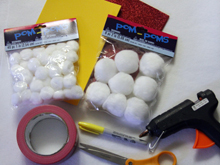 Make another pom pom popcorn kernel by gluing 2 small pom-poms together and then gluing these to a large pom-pom. Glue 1 more small pom-pom on the other side of the large pom-pom to form the complete popcorn kernel. If desired, color popcorn kernel lightly with the yellow marker (especially in the crevices where the pom-poms meet each other) to make the popcorn look buttery. 5. Once dry, glue the popcorn kernel to the top of the hat. 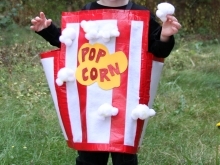 What to wear underneath the popcorn costume: Wear neutral pants or leggings (black or white) or tights (black, white, red or striped) and black, white, or red shoes. Wear a black, white, or red turtleneck, long-sleeved shirt, or hooded sweatshirt underneath the popcorn bucket. Popcorn treat buckets: Pick up a cardboard popcorn bucket next time you go to the movie theater and add a ribbon handle; or buy a plastic popcorn bucket at the dollar store and add a duct tape handle.